Who are they to us? Who were they? What is known about this branch of our (?) family? There is a postcard that Kostya (Konstantin Sergeevich) Andrianov wrote in 1913 to my grandmother Ekaterina Vasilevna Letova, who was then 14 years of age, from Saint Petersburg to Moscow. That Kostya’s greeting card was addressed to “Grandmother and Aunt.” He signed it: “your loving brother Konstantin”. That card was written after Kostya returned from Moscow where he visited Katya’s family and enjoyed the hospitality of their home. Well, he cannot be her brother really, but he can be her first or second cousin. Who were “Grandmother” and “Aunt” to him exactly? It seems that we have found out everything. But something was still unclear: It was known in our family that Evdokia, the youngest child in the family, had two older brothers Ivan and Jacob and one older sister Pelageya (Polya) who lived in Egoryevsk, where Evdokia had acquainted with her future husband Vasily Letov. Pelageya had daughter Anna and son-in-law A.Kondratev, the partner of V.A.Letov in the Trading House. Who was that estrange sister? 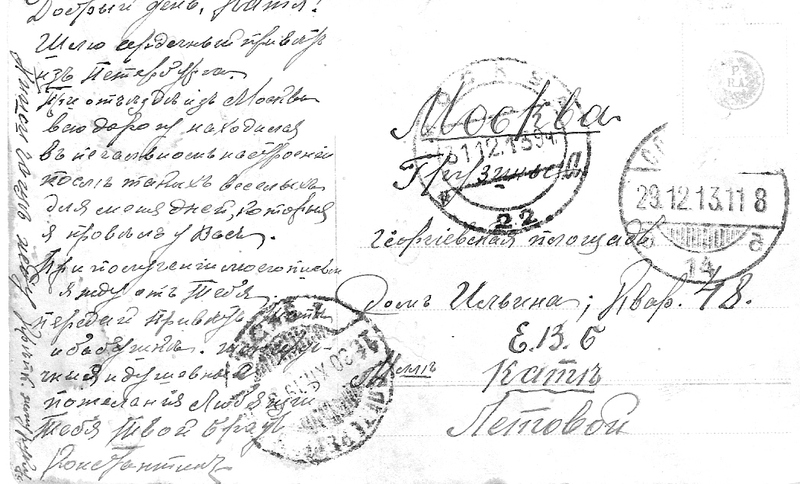 There are also some pieces of correspondence between Konstantin and his brother Nikolay. 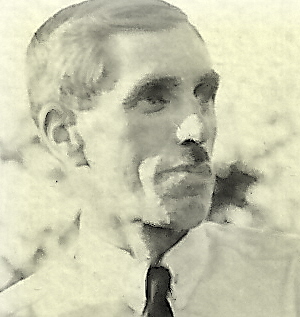 There are a few Konstantin's pictures taken in summer 1929 when he was at Letov’s summer residence in Bakovka. There is Ekaterina's photo (she was already surnamed Semenova) with "Nephew" (as it was written on the card) Leonid Nikolaevich Andrianov, son of Nikolay Andrianov. Let's try to solve that puzzle ourselves. If Konstantin Sergeevich Andrianov called Evdokia Vasilevna Letov nee Surikov ‘Aunt’, it means his mother was a sister to Evdokia or sister of Vasily Letov. It means there was one more Evdokia’s sister or Vasily Letov's sister. I have found that previously unknown sister of Evdokia! Her name was Paraskeva and she was older than Evdokia but younger than Pelageya. The 1869 Household Censuses of Timshinskaya Volost of Volokolamskiy District of the Moscow Province mentioned two older daughters of Evdokia's parents – Pelageya 5 y.o. and Paraskeva 1 y.o. Probably, Paraskeva was Konstantin’s mother. But maybe Evdokia, who was born in 1879, had one more sister; that sister would be younger than Pelageia and Paraskeva but older than Evdokia.